Today’s enterprise organizations need visibility into and control of how data is accessed and used to maintain security and compliance, while still providing business users with a way to get work done. Enterprise software must adapt to these competing forces and provide tools that meet their security and compliance standards while still giving employees a way to freely innovate and collaborate on work. 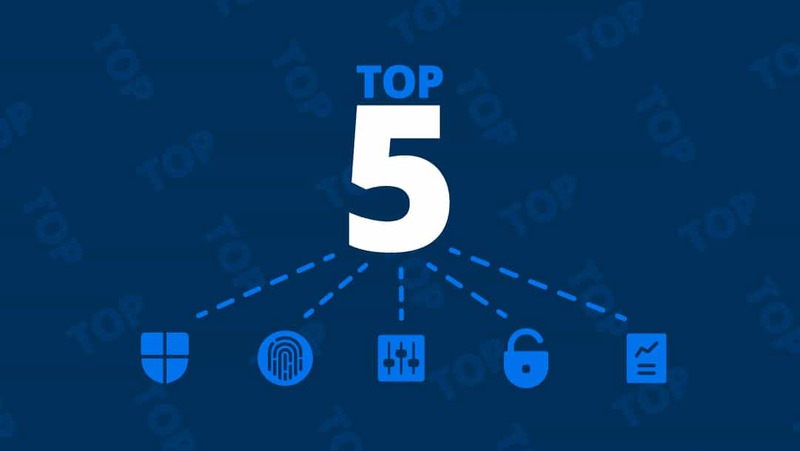 Here are five key ways enterprise organizations can manage data visibility and control in their work execution platforms, without sacrificing collaboration and innovation. As an enterprise, it’s critical for you to know who has access to your company information and what they are using it for. When managing a work execution platform, make sure you use the global security controls to ensure safe exchange of information inside and outside of your organization. For example, you may want to set up an approved domain sharing list to prevent information from being shared to an unauthorized email address or manage specific group memberships. With extensive administrator controls available, Smartsheet allows you to manage and audit access, ownership, and usage of your instance. Some of the global security controls available today include approved domain sharing, account discovery, resource management, and custom user welcome screens. Securing systems, applications, and data begins with identity-based access controls. Help protect your organizational and personal information from unauthorized access while making it available to legitimate users whenever and wherever they need it. With identity and access management features built into Smartsheet, you can rest assured that your organization's data is secure and protected. For example, on an Enterprise Plan, System Admins can enable Single Sign-On (SSO), giving account users the ability to easily sign in with their company credentials, helping to reduce risk and increase compliance. It’s important for your work execution platform to be easily configurable so you can make sure your users are set up for success. Smartsheet offers a number of configuration controls allowing you to set up plans and users in a way that best supports your business objectives. Globally configure user types to designate what individuals can and can’t do within your Smartsheet account, automatically add users to your enterprise account with automated user provisioning, or adjust account settings for features and working days. These configuration controls allow you to easily manage the way your users are working and ensure it’s in line with company policy. It’s no secret that people across a single organization use the capabilities of a work execution platform in very different ways. Because not every user is the same, Smartsheet gives you the ability to grant user-based permission levels to make sure the right people have the appropriate level of access to the data and capabilities they need. To take permissions one step further, we’ve recently released Smartsheet Dynamic View, new granular sharing controls that enable business owners to share information with the right people at the right time for viewing or editing, without accessing their underlying sheet. Dynamic View helps businesses maintain the confidentiality required for complex work processes without hindering collaboration. As an IT or account administrator, you need detailed visibility into how your users across your organization are using your work execution platform so that you can gain a clear picture of tool adoption and impact across your organization. Smartsheet offers a number of standard and custom reports to give you the insights you need to audit and manage your users at scale. 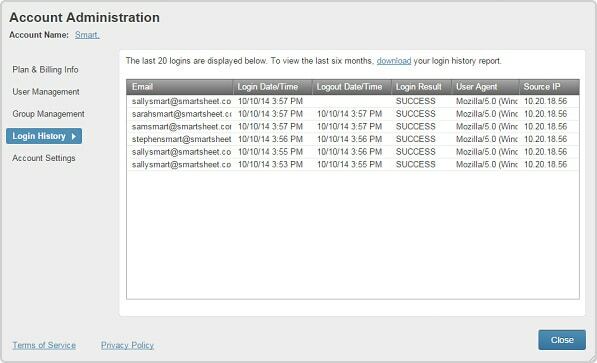 With Activity Log and SysAdmin features like the Login History tab, you can get accurate user activity data that helps you gain the visibility you need. With Smartsheet, you can spend less time worrying about compliance and more time running your business. Your teams are empowered to freely collaborate, while you rest easy knowing you can rely on our secure and flexible work execution platform. Learn how Smartsheet can help you manage large-scale initiatives with confidence and empower your teams to collaborate at the speed of business.